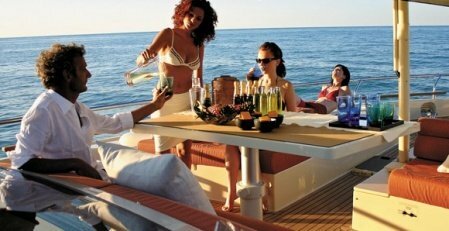 Creating order on website www.goayacht.com or confirming by email mean you agree to the following terms and conditions use of luxury Boat/s or Yacht/s. All Bookings within 21 Days, 100% payment required for confirmation. More than 22 Days, 50% deposit for confirmation and balance before 21 Days of charter. Cancelation less than 20 day prior, No Refund. Marine Asia /George Duglas (Company) reserves rights to cancel sailing/charter due to weather condition and/or any kind of Technical Failure in Boat/s/or Yacht/s. Marine Asia /George Duglas (Company) will not responsible for any kind of loss or damages due to cancelation of charter on Technical Failure and/or Weather Condition for Boat/s/or Yacht/s sailing on booked date. Fuel/Jetty charges, soft drinks and water, Captain and Crew services are included in price. Pick up or Drop from hotel/accommodation is available on extra charges. No Food is included in published price, available on request. Please ensure before disembark about all your valuables, after disembarkation we are not responsible for any claim. Taxes are applicable as per Government rules. We wish you very wonderful experience with Marine Asia, Goa Largest Yacht Rental Company.